Welcome to the first installment of Design in Action. This weekly column will be my long-term project for USgamer once I step down at the end of the month, but we figured, "Why not kick it off now?" This series is loosely inspired by the old Anatomy of Games articles I used to publish in my free time. Each month, I'll take a look at a great game - some new, some classic - and pick it apart over the course of several weeks, looking at different aspects of that game's excellence and how all its pieces work together. This month, I'm celebrating the 20th anniversary of one of my all-time favorite games, Castlevania: Symphony of the Night for PlayStation. With Symphony of the Night, Konami performed a rare sort of alchemy. The development team — initially led by Toru Hagihara, with Koji "IGA" Igarashi picking up the reins midway through — created a game that worked on multiple levels. It defiantly ran counter to the conventional game design thinking of the time, which flatly declared traditional bitmap sprites, hand-drawn backgrounds, and two-dimensional gameplay to be dead and buried. 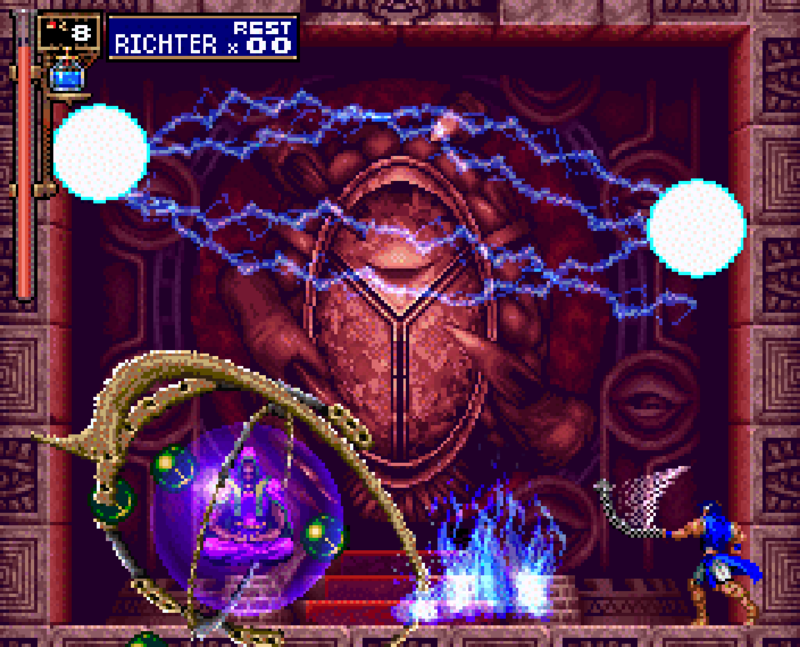 The Symphony team put together a game that embraced all of those things while at the same time incorporating cutting-edge effects that would have been impossible before the PlayStation; indeed, even the SEGA Saturn, 2D powerhouse that it was, struggled to replicate Symphony's subtle polygonal effects and features. Theirs was a brave statement in 1997: Not only is there still room for classic game forms, they said, but they have room to grow and evolve by incorporating next-generation technology. The Symphony team could afford to be a little daring, because they had a great legacy behind them: The beloved Castlevania series. Creating a sequel has never guaranteed automatic success for a game, but it does provide something of a safety net. And Symphony wasn't simply "a sequel"; it was the sequel. Perhaps the greatest sequel ever created. One that simultaneously embraced its heritage while expanding on it in new and exciting ways, both conceptually and technically... and in a manner that united both the conceptual and the technical so that one fed into the other. Much like Super Mario 64, Symphony felt revelatory in a way that seems impossible for a modern game to achieve... though of course its revelations were completely different in nature than those of Mario's first 3D outing. To my mind, Symphony works as a sequel on three different levels: Narratively, structurally, and mechanically. In each of these areas, the game builds on what had come before in a brilliant fashion, then puts its own spin on things. Castlevania would never have this kind of impact again... but then again, few games can compete with Symphony. The first problem the Symphony team had to overcome when planning their Castlevania sequel was the question of what, precisely, the phrase "Castlevania sequel" actually meant. Once the 8-bit NES Castlevania trilogy came to a close, the series had no unifying through line. Super Castlevania IV had gone for baroque, with its moody atmosphere and oversized character sprites, but it was followed by Rondo of Blood for PC Engine (which felt like something of a throwback to the NES games), Bloodlines for Genesis (which seemed even more of a throwback), and Dracula X for Super NES (which reworked Rondo into the biggest 8-bit throwback of all). Beyond the basic concept of 2D platform action starring a guy with a whip, usually, there was no real consistency in the nuts-and-bolts of Castlevania. Nor was there a real narrative framework for the games besides "a man kills Count Dracula." The Symphony team included several people who had worked on Rondo of Blood, so it might seem logical for them to have looked to their previous work for inspiration. 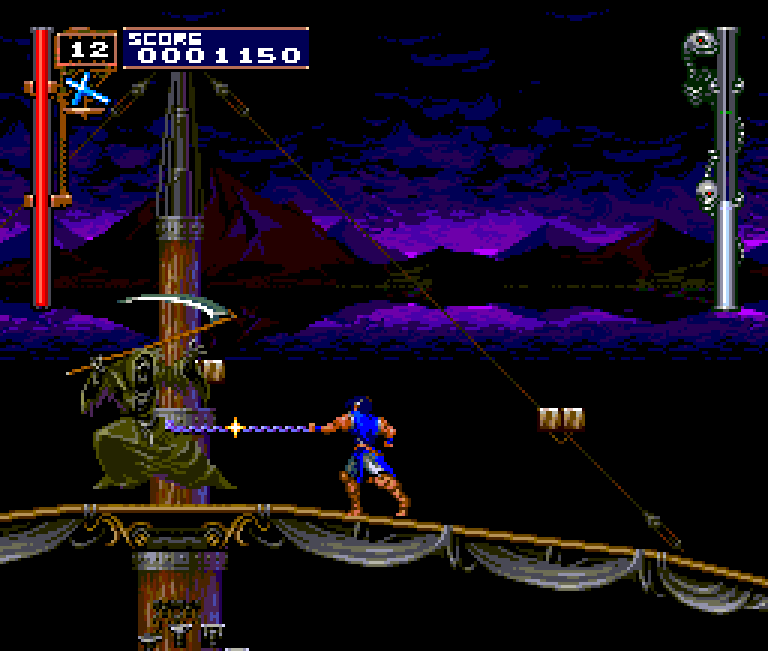 That wasn't originally the plan, though; before they began work on Symphony, they laid the groundwork for an unrelated Castlevania project tentatively called "The Bloodletting," which would have appeared on the SEGA 32X. When that platform bobbed belly-up to the surface almost immediately after its debut, however, the team started fresh with a proper Rondo follow-up. The basic question that then arose was: "How do you make an interesting story out of a game with a definitive ending?" 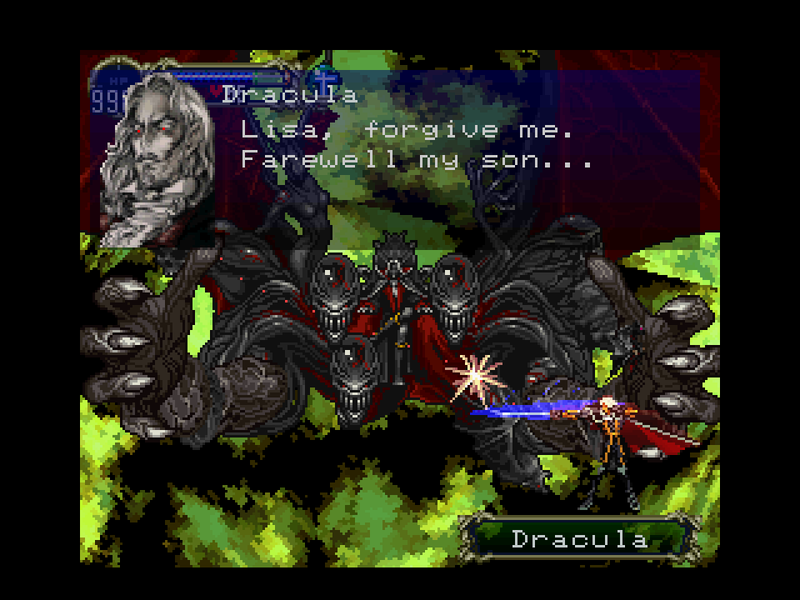 Rondo had featured far more dialogue and narrative than any Castlevania before it, with cutscenes and alternate endings, but it ended quite conclusively with Dracula being destroyed and the hero reunited with his beloved. The simple fact of the matter was, Richter Belmont's story had reached its natural conclusion and didn't really have much of anywhere to go beyond that. This Week on Retronauts, We Ask: "What is A Man?" The Symphony team's solution? Look beyond Richter. While the so-called "greatest Belmont" still had a part to play in the sequel to his earlier adventure, his part was no longer that of leading man. Instead, Symphony reached back into Castlevania's past to link Rondo to the NES Castlevania games. Rather than star a Belmont, Symphony instead placed the son of Dracula in the lead role. Alucard — more properly known as Adrian Farenheit Tepes — had been one of three optional characters available to play in Castlevania III: Dracula's Curse for NES, which had been set about 300 years before Rondo of Blood. As an immortal dhampir, it would make sense that Alucard would still be around in some capacity even all those years later. Yet his inclusion as Symphony's protagonist did more than simply offer a nod to an earlier Castlevania game (something the team had already demonstrated a predilection for by opening Rondo in the ruins of a town from Castlevania II); it also opened the door for a more comprehensive and consistent storyline for the Castlevania saga. 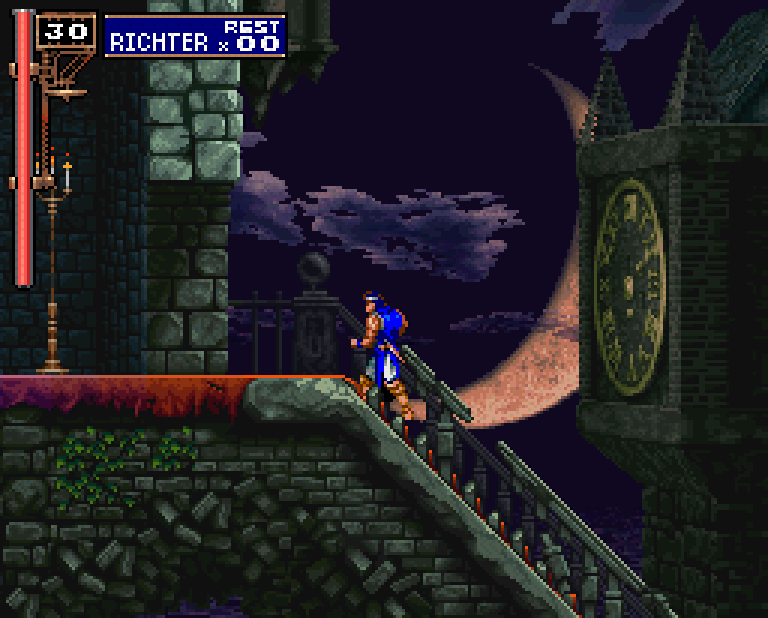 By connecting Richter's quest to that of an ally of his many-times-great-grandfather Trevor, Symphony began to establish the rules under which the Castlevania universe would operate going forward. Symphony locked into the concept of Dracula as a primal force destined to return to life (or un-life, as it were) once every century. It also justified the familiar but shifting tapestry that was Dracula's castle itself. Why does Castlevania always feature common elements between games — the zombie-haunted opening corridor, the clock tower, the march at an impossible angle to reach Dracula's chamber — yet never in the same configurations? Because it's "a creature of Chaos," as much a living entity of evil as Dracula himself. At the same time, Symphony also began to paint Dracula as something besides a ravenous destroyer, offering a glimpse into the circumstances that turned him into the monster he'd become. His relationship with Alucard, though filled with acrimony and resentment, allowed for a touch of subtlety impossible in the simple, direct hostility of his encounters with the Belmont warriors sworn simply to destroy him. Dracula's cruelty, and Alucard's hatred of his own father, stem from the same source: Lisa, Dracula's one love and Alucard's mother, a kind and caring human woman burned at the stake for the crime of consorting with a vampire. Throughout Alucard's journey, small snippets of story emerge that tie everything together: The fallout from Richter's journey in Rondo of Blood, Alucard's alliance with Trevor Belmont in Castlevania III, and the genesis of the entire Castlevania saga beginning with the murder of Lisa countless years prior. Symphony certainly stands as a strong sequel to Rondo; over the course of the adventure, it comes to light that Richter has been ensorcelled by Dracula's evil priest Shaft, who had served as the vampire's right-hand man in the battle against Richter. Meanwhile, Alucard's greatest ally turns out to be Maria Renard, Richter's young sister-in-law, who had appeared as a bonus unlockable character in Rondo. But the game's greatest narrative strength, and its status as the Castlevania series' keystone, comes from the way it links obscure side-story Rondo to the overarching Castlevania narrative while establishing rules and systems for numerous games to come. Next week, we'll look at the game's structure, and how Castlevania evolved by taking design lessons from one of Nintendo's biggest franchises. No, not the one you think. The other one. Tagged with Action Adventure,	Analyses,	Classic Deep Dives,	Design in Action,	Platformer,	PlayStation,	Retro,	Role Playing Games.